Women join the group either through referral from a health professional, as a self-referral, via this website, seeing a brochure in an oncology department, or by word of mouth. In our experience it is most helpful to encourage a woman to contact us directly, particularly if she has questions about the group, or concerns or anxieties about joining such a group. We are happy to speak to women to help clarify these issues without any requirement that they take things further if they do not wish to do so. We have found over the years that the optimal time for a woman to join the group is close to the diagnosis of secondary cancer. The group offers a place to bring some of the questions that crowd in at this stage, and they are in a better position to make connections and friendships with the other women, and gain the support and help that the group can offer. Once a referral or enquiry has been made an interview is organised with the woman, and if possible, her partner, to talk about the group and to answer any questions. Once the woman has joined the group we encourage her to attend as regularly as she is able, as this too enhances the support network that the group provides. To read what health professionals say about our group, click here. 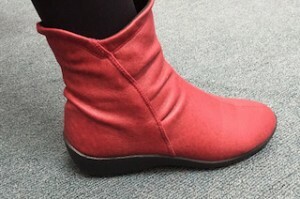 While we cannot endorse any particular brand, one of our women has found these boots, from Arcopedica, very helpful in relieving pain and burning in her feet.